Thanks to the generosity of the Knight Foundation, The Wolfsonian museum building will soon be getting a facelift of sorts, with new architectural lighting and plans to project “fugitive” images from the collection as if they were spilling out of a crack in the façade of the building. 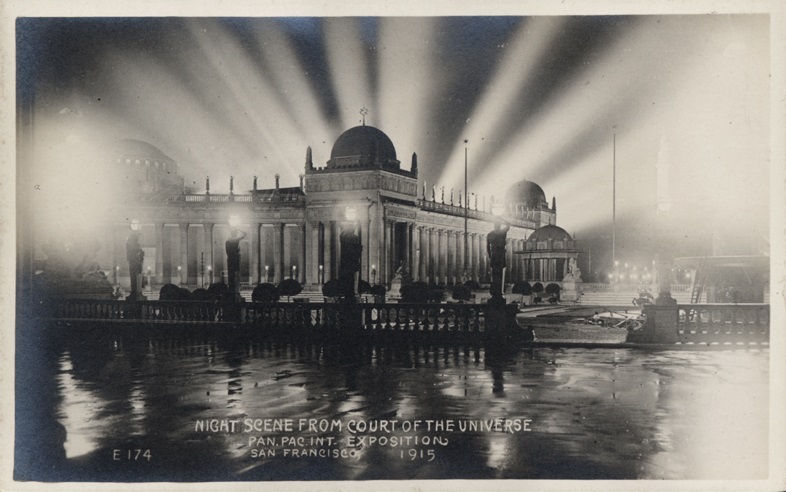 Below is an early artistic rendering of how the lighting effects might reshape the museum’s appearance at night. THE ART OF ILLUMINATION: ILLUMINATING THE ARTS DIGITAL DISPLAY. As plans move forward with that project, we received a visit last Friday from Theresa Famularo, the Senior Project Manager for Vivid Sydney. Ms. Famularo is recognized around the world as one of the “leading lights” in event, art, theatre, and architectural illumination. 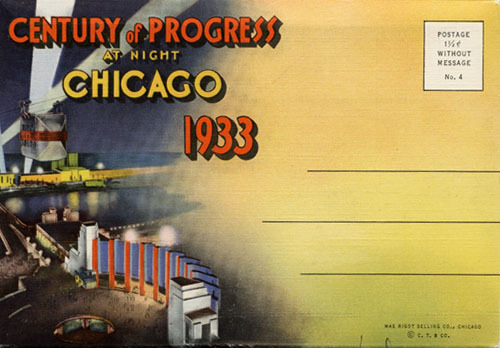 To prepare for her visit to the library, I pulled a few postcards, leaflets, brochures, and view books produced for various twentieth century expositions. 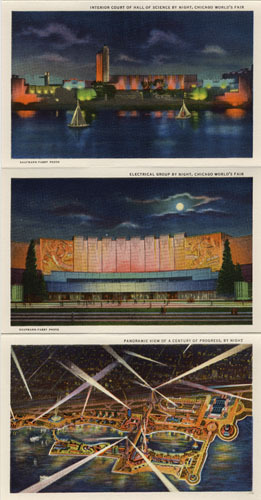 As was obvious from the display of materials I laid out on the main reading room table, world’s fairs and international exhibitions had been extremely important venues for showing off and selling the public on electrical lighting. 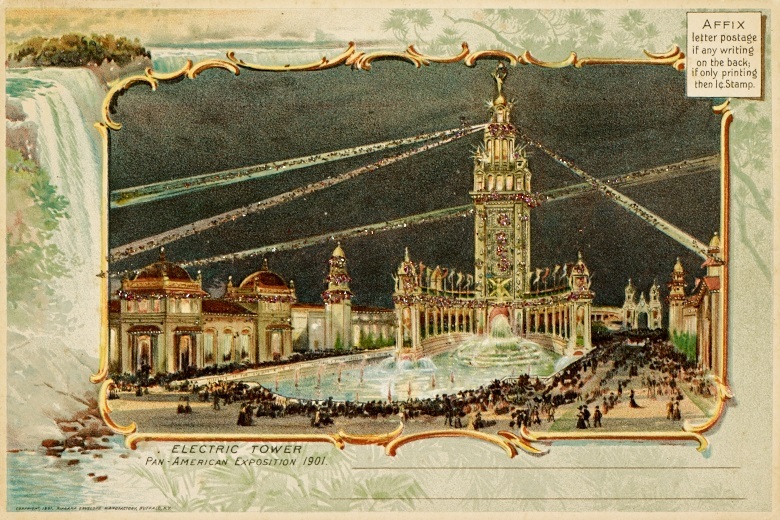 An oversized postcard from the Pan-American Exposition held in Buffalo, New York in 1901, for example, used an evening view of the Electric Tower and fountain to demonstrate the beautiful effects that could be achieved by lighting up the night. 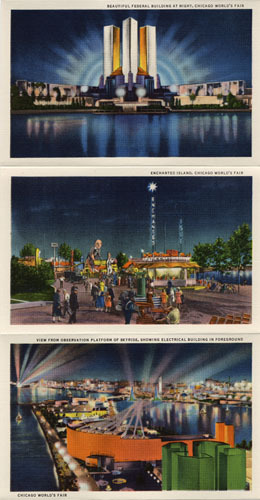 To emphasize the dazzling effect of spotlights, the printer added some pink and gold glitter to the beams of light. 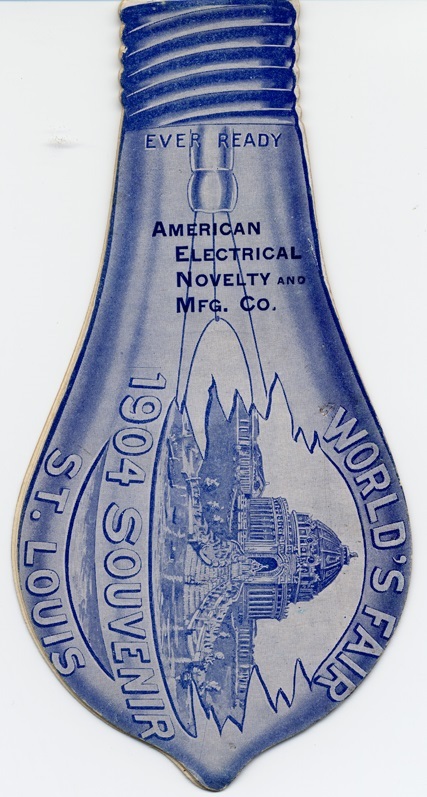 For the exposition held in St. Louis, Missouri in 1904 (marking the hundred year anniversary of the Louisiana Purchase), the American Electrical Novelty and Manufacturing Company published an advertisement in the shape of an incandescent bulb showcasing their Ever Ready Electric Lights. 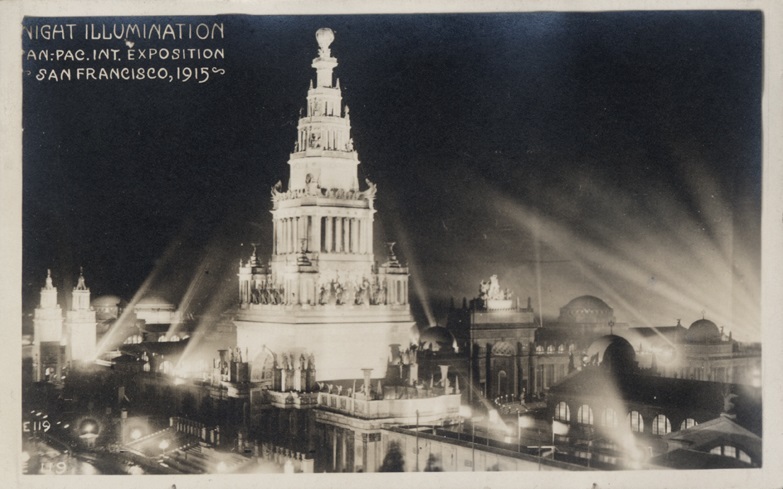 By far, the most numerous night views of any fair in the Wolfsonian library collection come from the 1915 Panama-Pacific International Exposition in San Francisco. 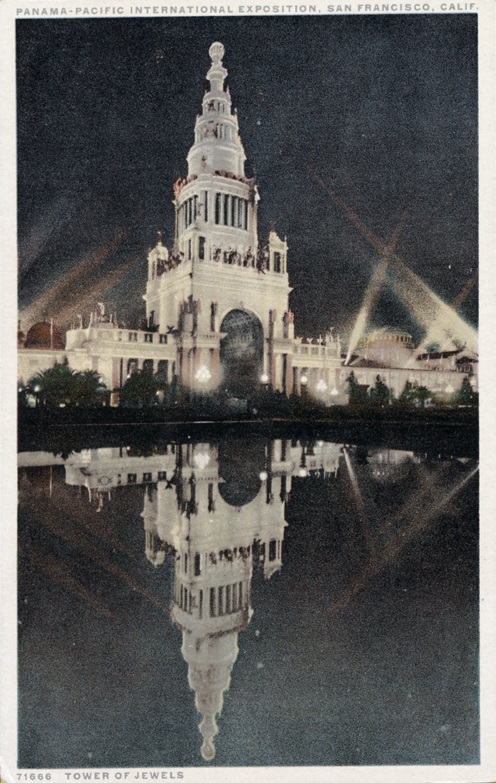 The library holds numerous vintage b&w photographic postcards showing the buildings lit up at night, as well as some over-sized and colorized postcards that most likely present idealized, rather than realized, special lighting effects. 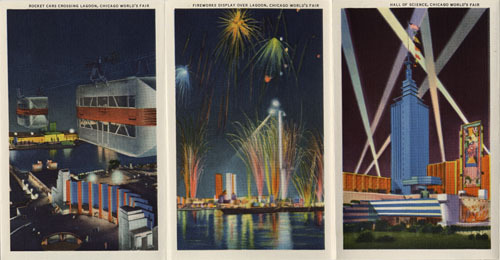 View books from Chicago’s Century of Progress Exposition (1933-1934) used color-printed postcards that fold out accordion-style to capture the decorative lighting of buildings and fountains from that fair. 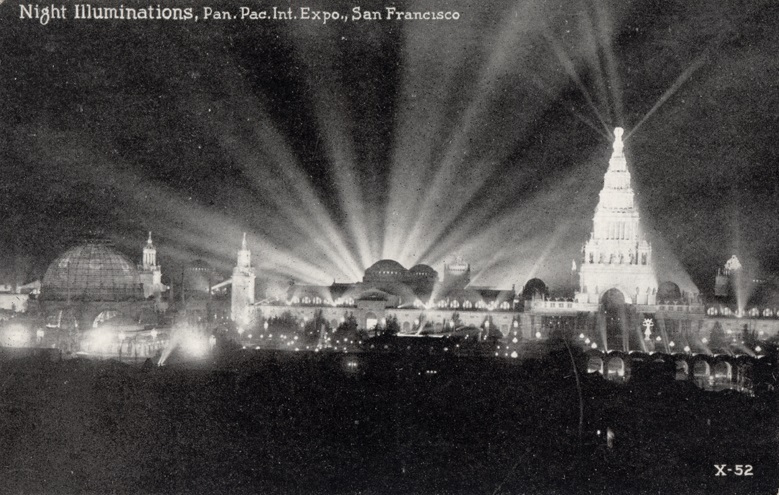 The “magical” effect that innovative fireworks and electrical lighting had on the public mind did not fade with the closing of that fair. 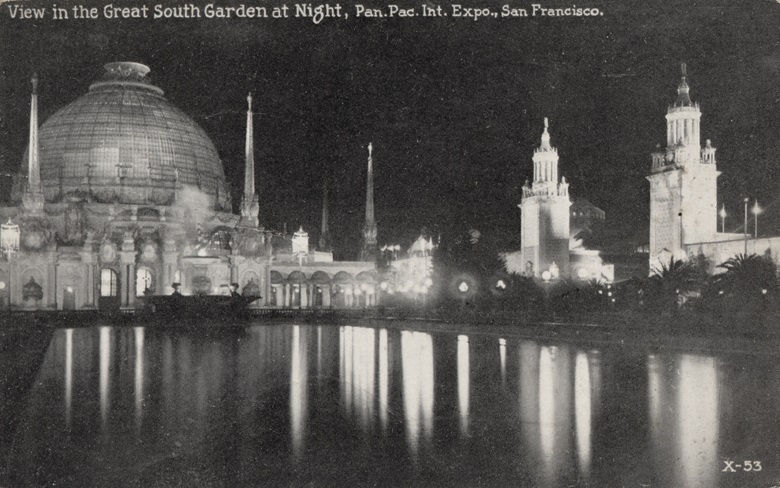 The Golden Gate International Exposition held on Treasure Island in San Francisco Bay in 1939 and 1940 also evoked the timeless appeal of Aladdin’s magic lamp and used images of the buildings at night to promote the exhibition. 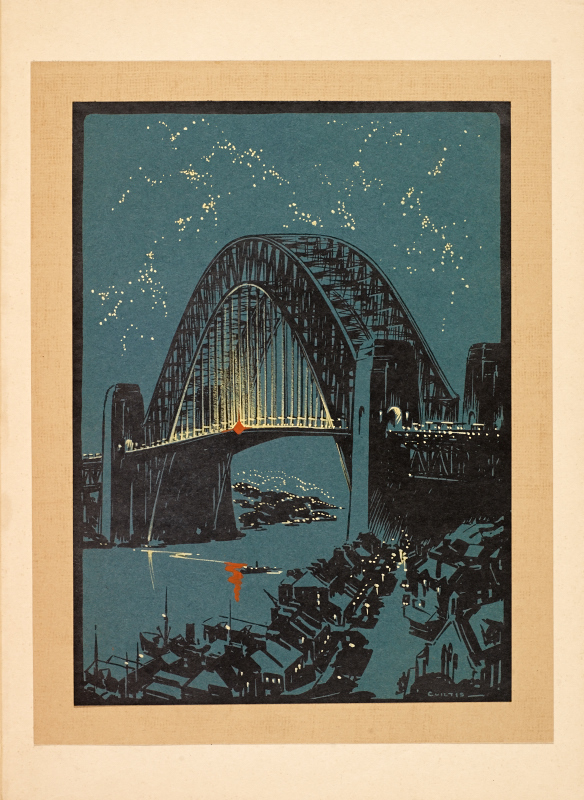 Since our visitor hailed from Australia and won fame for some of the spectacular effects in illuminating the Sydney Harbour Bridge, we also pulled Robert Emerson Curtis’s Building the Bridge, a rare book with twelve lithographic illustrations of the structure from construction through completion. 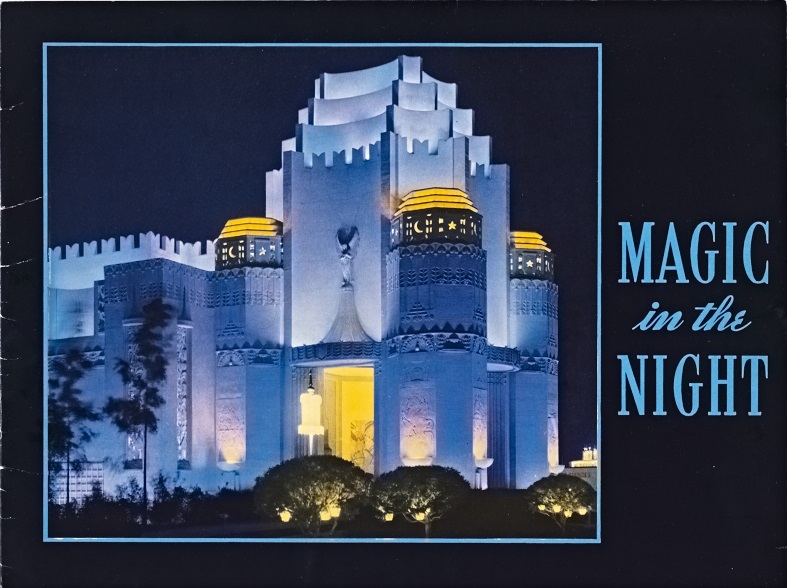 The final color plate showed the original lighting of the bridge which pales in comparison with some of the spectacular effects Ms. Famularo shared with us of the bridge lit up on New Year’s Eve and for other dazzling special events. ~ by "The Chief" on September 11, 2013.
thanks for this great post. 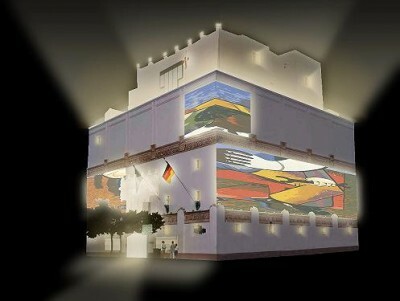 exciting possibilities for the the Wolfsonian! 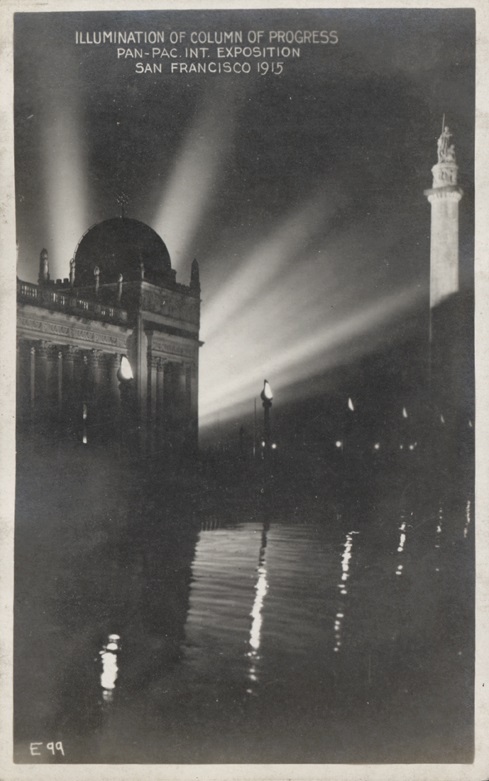 (challenging, too, as some of these image-projection projects at museums haven’t worked out that well.) 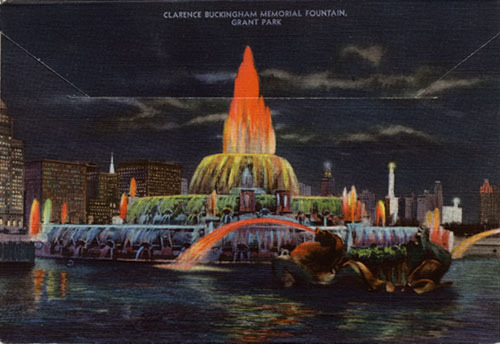 one note i’d add re the history of lighting at worlds fairs: i believe the first use of neon lighting occurred at the Chicago WF of 1933. again, thanks for this and your other terrific posts.